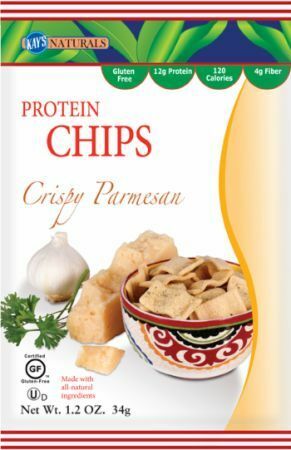 Non-GMO Soy Protein Isolate, Non-GMO Yellow Corn Flour, Non-GMO Rice Flour, Corn Starch, Non-GMO Soy Flour, Tapioca Starch, Potato Flour, Pea Fiber, Fibersol, Vegetable Oil, Sugar, Chili Nacho Cheese Seasoning (cheddar cheese powder [cheddar cheese, pasteurized milk, cheese culture, salt, sodium phosphate), Dehydrated lemon-lime, Garlic powder, Onion Powder, Dehydrated Chici Pepper, Spices, Whey Culture, Buttermilk, Paprika, Citric Acid, Lactic Acid), Non-Aluminum Baking Powder, Xanthan Gum. Whether at the gym, in the office, or watching your favorite show-great satisfaction with Kay's winning nutrition!. Contains soy & milk (cheese). Products containing soybeans, dairy and tree nuts, are manufactured on the same production line as this product. Non-GMO Soy protein isolate, non-GMO yellow corn flour, non-GMO rice flour, corn starch, non-GMO soy flour, tapioca starch, potato flour, pea fiber, fibersol, vegetable oil, sugar, parmesan cheese seasoning (salt, whey, nonfat dry milk, parmesan cheese, buttermilk solids, sodium phosphate, dehydrated lemon lime, garlic powder, onion powder, dehydrated tomato, spices, yeast extract, citric acid, lactic acid), non-Aluminum baking powder, xanthan gum. On the go, in the office, or watching your favorite show-great satisfaction, good nutrition....better balance. Contains soy & milk (cheese). Products containing soybeans, tree nuts, and dairy are manufactured on the same production line as this product. Soy protein isolate, degermed yellow corn flour, rice flour, corn starch, full fatted soy flour, tapioca starch, potato flour, pea fiber, inulin, canola oil, cane sugar, natural chili nacho cheese seasoning (cheddar cheese powder (cheddar cheese, pasturized milk, cheese culture, salt, sodium phsophate, lactic acid), dehydrated lemon lime, garlic powder, onion powder, dehydrated chili pepper, spices, whey culture, buttermilk, paprika, citric acid, lactic acid), non aluminum baking powder, salt, xanthan gum. Soy protein isolate, degermed yellow corn flour, rice flour, corn starch, full fatted soy flour, tapioca starch, potato flour, pea fiber, inulin, canola oil, cane sugar, natural parmesan cheese seasoning (salt, whey, nonfat dry milk, parmesan cheese, buttermilk solids, sodium phosphate, dehydrated lemon lime, garlic powder, onion powder, dehydrated tomato, spices, yeast extract, citric acid, lactic acid, non aluminum baking powder, salt, xanthan gum. Get energized with Better Balance snacks. Better Balance snacks help you maintain balance without giving up satisfying treats. 12g lean soy protein per 1-ounce serving - 33% PROTEIN! Low saturated fats / No trans fats / Zero cholesterol / No sugar substitutes.